Small - $73.99 Medium - $73.99 Only 5 left! Large - $73.99 Only 4 left! Looking for a costume with more of a foreign feel to it? Maybe there’s a folk festival coming up soon and you want to join the celebrations. Perhaps Halloween is right around the corner yet again, but dolling up as a foreign traveler sounds way better than going out as a supernatural creature. 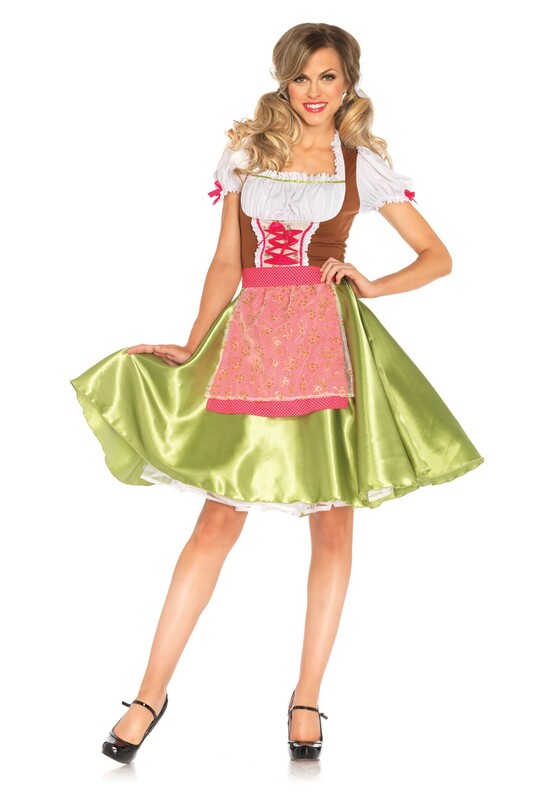 Well, with this Women’s Darling Greta Costume you’ll be ready for plenty of Oktoberfest merriments and Halloween festivities! Once you toss on this lovely Bavarian styled dress and enter the party scene, you’ll be quite the sight to see. It will look as if you left your tiny hilltop village to enjoy your first big-city party. At a Halloween bash, you’ll stick out of the crowd like a rose in a bed of ashes when you’re strutting about in these playful and colorful duds among crowds of creepy crawlers and spooky specters. Any Oktoberfest celebration you attend, you’ll fit right in. Some may even think you just flew in from the old country! What we’re saying is that this beautiful dress will easily give you the foreign look that you desire. Now all you need to do is take this Darling Greta Costume to the next level by personalizing your new look a bit. Customize your outfit by grabbing a handful of the accessories we have available. Look through the variety of white knee-high stockings we have in stock, grab one of our Beer Stein Purses, and maybe even a Blond Braided Wig to top off this Euro-transformation.